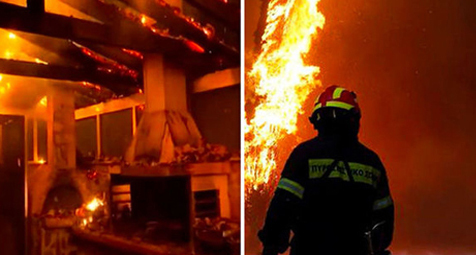 ATHENS, Greece (AP) — Greek authorities say the death toll from this summer's devastating forest fire near Athens has risen to 99, after a woman injured in the blaze died in the hospital. Another 83 people were killed in the blaze or drowned in the sea trying to escape. A judicial investigation is underway into the cause of the fire — Greece's deadliest in decades — and into whether authorities responded adequately to the emergency. M-Fire is on the phone tomorrow with a direct connection to the Officials in Greece, as they scramble to find a better way to defend people and homes. Countries like Greece, that build homes with concrete don’t have the same fire issues we do here in the USA with wood framed construction, however, they do have roofs that are framed with lumber. M-Fire's proactive approach to wild fires that threaten to destroy homes and kill people is to keep the wild fires out of the communities with a pro-active clean fire chemical as a fire break around the neighborhoods. What our QAI 3rd party accredited fire laboratory test results and all our live demonstrations are proving is our Mighty Fire Breaker™ will keep wild fires away from the homes, if we are proactive and protect early in a wild fire advance. Dropping chemicals and water over the flames is reactive and we are saying add us to you fire elimination plans and we go after saving the homes and people while the firefighters are out on the fire trying to give us time to lay down the fire breaks. Put this combination together and we will save homes all around the world. It will be interesting if we get the attention of Greece before Governor Brown as he is busy now at the SF Climate Summit with all the Hollywood elites pitching to get more clean energy, instead of finding news way to defend homes and people from the reality of wild fires in California.